I am back! Did you miss me? I missed me! Its been three months since I have been able to even think about posting a recipe or doing a DIY. Where have I been? Just trying to figure out how to grow a tiny human inside of me! Surprise! Let me tell ya...this is no small feat! More on that later though. 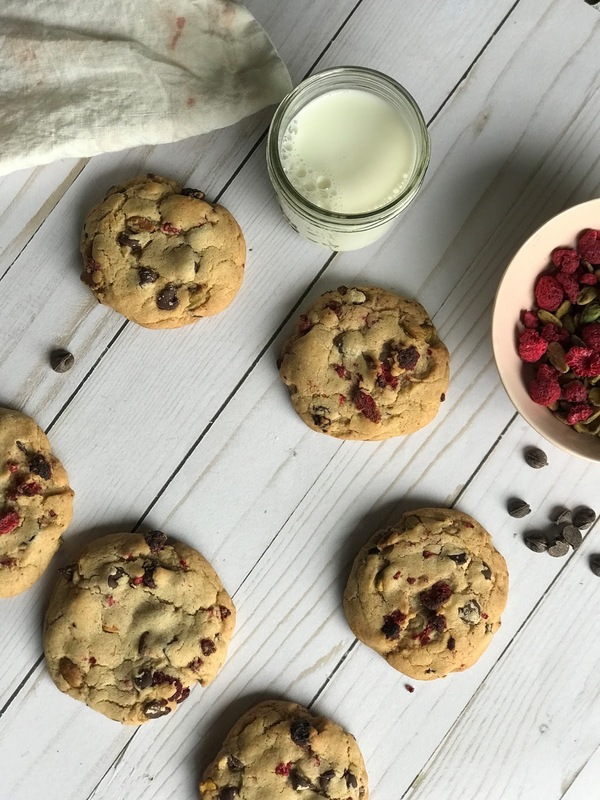 This post is about cookies not babies. I actually created this recipe before I found out that I was pregnant but was never able to write this post because the sickness was real. But now I am so happy that I have this one in the queue to share and I think I will whip up a batch this weekend! I wish I could eat like six of these right now! They are so delicious! 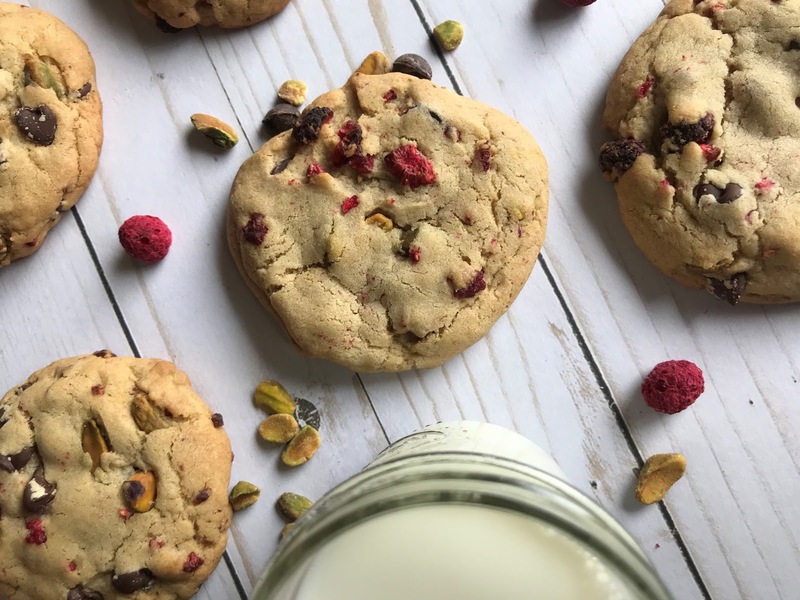 The combination of Raspberry, Pistachio, and Dark Chocolate is one like no other! And the consistency of these cookies is pure perfection. They are thick and chewy but have crispy edges. In my opinion that is the making of the perfect cookie! Preheat your oven to 375 degrees. Line baking sheets with parchment paper. Beat together sugar and butter until light and fluffy then add in egg and vanilla. In another bowl mix together flour, baking soda and salt. 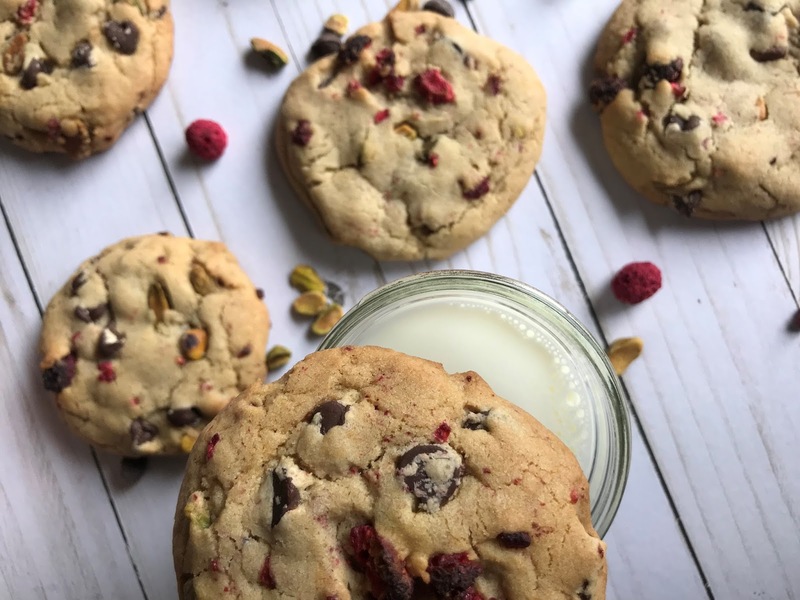 Add flour mixture to your wet ingredients and beat until combined then add in chocolate chips, raspberries, and pistachios. Line baking sheet with parchment paper. Adding heaping spoonfuls of dough to the baking sheet. Bake for 9-11 minutes. Watch them while they are baking because they don't take long.